Here is another salt bar made from my weekend at Prairie Soap Company with Benjamin. 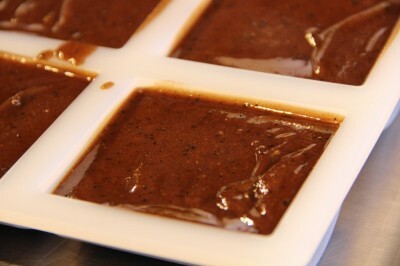 If you missed the African Black Soap Salt Bar – check it out here. The soap comes out ROCK HARD and seems to last quite a bit in the shower. My salt bars last forever. Because they set up fast and hard, I prefer to do salt bars in individual cavity molds. My favorite salt bar shape, and a way to make them unique and different than my regular bar soap, is a half round /half cylinder shape. This mold from Bramble Berry is absolutely perfect. ADDED: I get this questions a lot. “With 100% coconut oil, aren’t these going to be super harsh?” NOPE! We use a 20% superfat which means we have 20% of free unsaponified oils in our recipe to help counteract the high amount of coconut oil giving us a really nice bar of soap. If you are new to making cold process soap, please visit my basic tutorial. Step 1 – Make your lye solution. Weight out the water and the lye into separate containers. Pour the lye into the water and stir. Set aside to cool down. 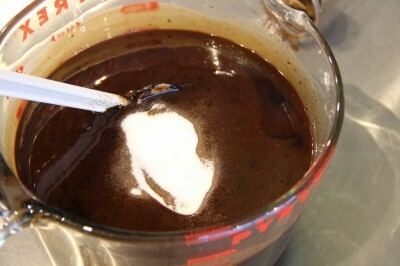 I added the cocoa and coffee to the lye solution, but cocoa is best mixed into the oils. So add the coffee to the lye and add the cocoa to the oils. Mix. Step 2 – Weigh out the coconut oil and melt. Melt just until melted and no longer. Set aside to cool down a bit. 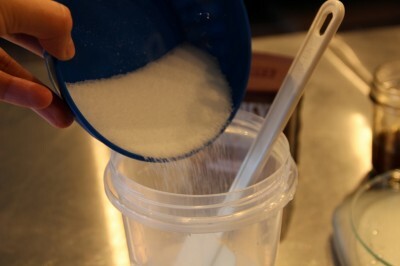 Step 3 – Weigh out the salt and essential blend so that everything is ready to go! 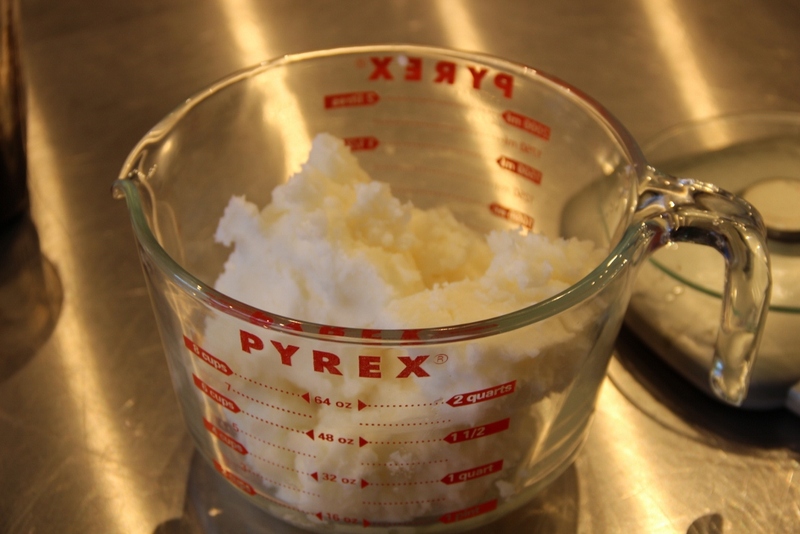 Step 4 – Time to make soap! Add the essential oil blend to the oils. 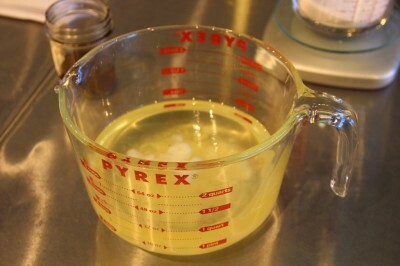 Add the lye solution to the oils. Mix until you get a very light trace. Once you have a light trace, add the salt. Mmmmmmmm these are decadent. The essential oil blend is amazing. Salt soap gets hard pretty fast so you’ll be able to unmold the same day! Be sure to let these beauties cure for a good 4-6 weeks and they’ll become nice and mild. I’m making this bar today and I want to leave out the EO’s, could I use smashed bananas to make up the weight of EO’s? Hi! I am wanting to order these molds from BB. How many do I need for this recipe? Thanks! I have read the ‘Sea Clay & Avocado Spa bar’ recipe in the free PDF guide..
1) Is the sea clay & avocado spa bar can be used every day on the face? Or is it used twice a week as a scrub to the face? If used every day, will it make face feeling dry? 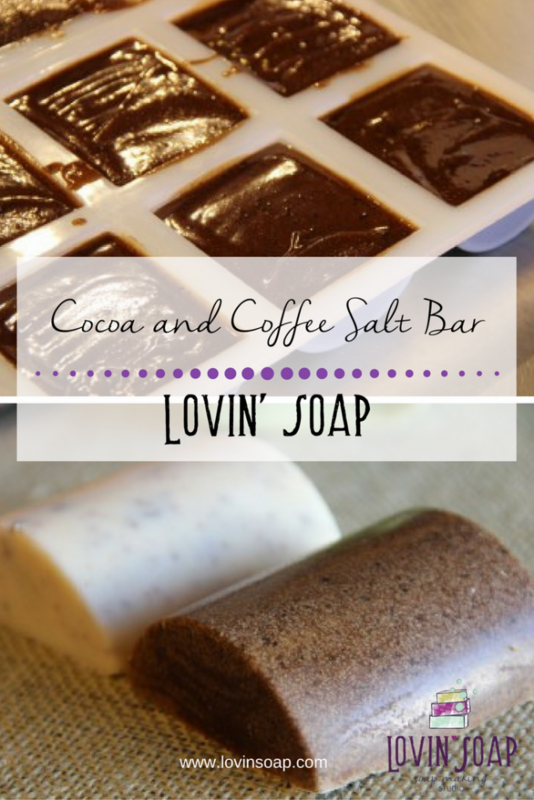 2) I believe that the cocoa & coffee salt bar can be used as a facial bar too. Can we use it every day as a facial bar or I should use it twice in a week as a scrub? 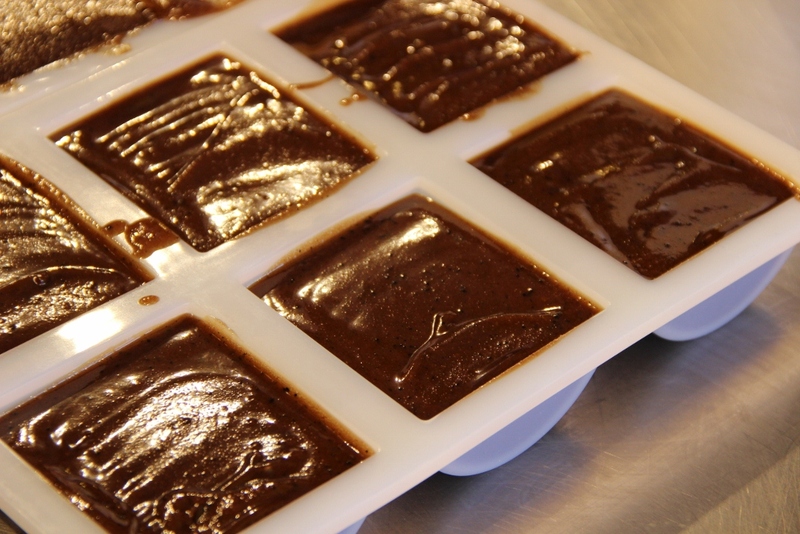 Thank you for the excellent sharing..
May I know whether Cocoa and Coffee Salt Bar (with 50% salt of oil) , is suitable for body soap bar…or for face bar? I’ve made two batches of this kind soap and made great fans, I just wanted to know is there any way to shorten the time needed to cure these cold process soaps from 4 weeks to shorter than 1 week? any idea like heating in oven? have had any experience? I am very sensitive to fragrances. Will it totally unbalance the recipe if I left out the fragrance oils? 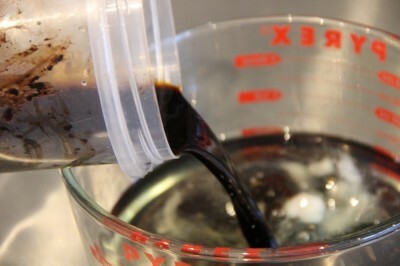 If so, could I just add another kind of oil instead, like olive or grapeseed or soybean…? Wonderful soap! Scented mine with anise and clementine eo! Will be making more for sure! You can use whatever scent that you’d like. Fragrance is all about personal preference. Hi Amanda, can I add some shea butter with the coconut oil. How much should I add? im new on making soap bar. Do you or anyone can please tell me, the yield of this recipe ? since it hard to find soap mold here, i’m using 7cm round pudding silicone mold. do you think 6 mold would be enough? LOVE your recipes!! However, to be more cost effective to my customers, what EO’s or even FO’s would be a good substitution? I would love to offer more of a vanilla/coffee/chocolate type scent. hi, can i make salt bars with different oil than coconut oil or even a blend of oils as it is so expensive here, thanks in advance. You mentioned a 20% super fat. Can you tell me what you used and when you added to the process. 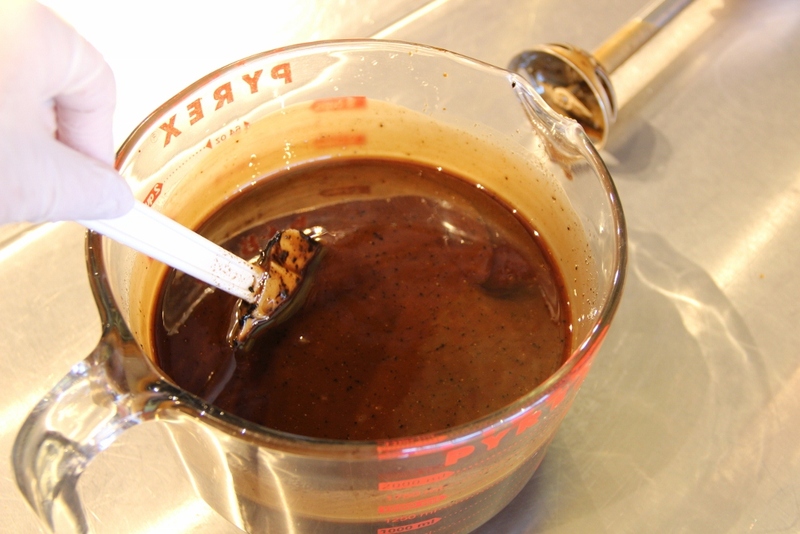 Hi Colleen – its already figured into the recipe and added to all of the oils. Can I pour into a rectangular box mold, then cut these? Or are salt bars too hard for slicing? Thanks! What does iodized salt do in a salt bar? I grabbed the wrong salt box a couple of weeks ago and ended up using iodized salt in a batch of salt bars. So far, doesn’t look any different than usual and seemed ok when I tried it out-a little early….?? Can’t find any info on why iodized salt is bad and would love to know. 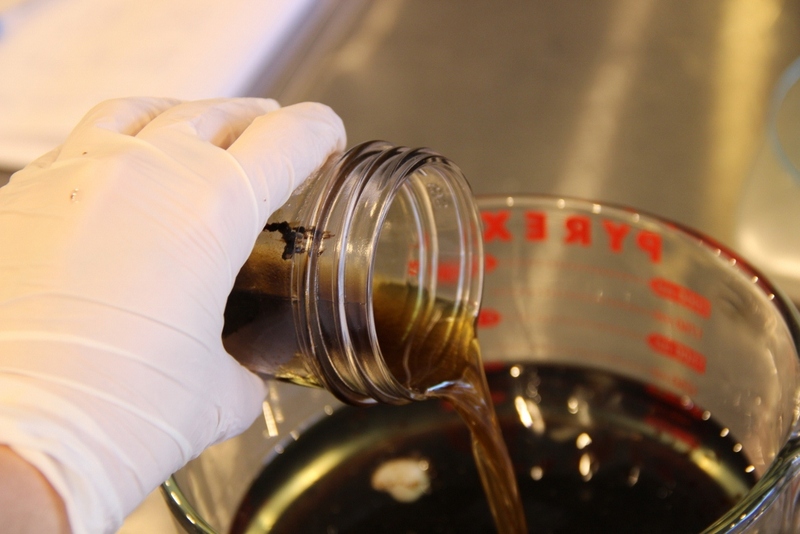 do you leave the coffee grounds in the lye solution or do you strain out before adding to oils? I’m looking forward to following your website! Hello facebook, and soapy friend, I would like to know where you got that great silicone mold ( the half circle )? Wonderful recipes by the way, looking forward to trying some of them. Thank you so much for this recipe, it sounds amazing and is on my list to make. 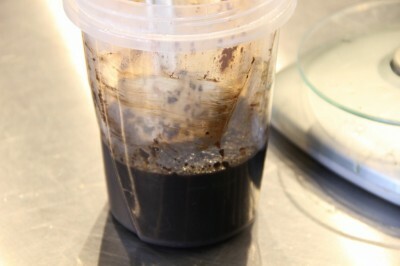 When you say “coffee grounds” in your recipe, do you mean used coffee grounds (I save for exfoliants in my soaps). Or unused as you want the stronger color/scent from them? Thanks again. You can actually use either! You get more color from unused but scent from the coffee usually doesn’t make it through the process. I love salt bars! Can Himalayan pink salt be used in a salt bar? I was thinking of throwing in just a little (w/ regular salt) for color and putting some on top of the bars …? Yes! I love Himalayan pink salt in salt bars! I am so going to try these. I have been using your recipes and love your commitment to palm free soap. I have always wanted to try vanilla, but have not found a place that carries vanilla 10x. Can you give the source, please? These sound decadent. I love salt bars too! Hey Amanda – I made your pumpkin coconut bars almost two years ago and still using them – they never sweat, they are awesome – thank you!! I want to make this and I love the EO combination, however, I have had to go nut-free so the almond would need to be traded out – what would be a suitable replacement for a still awesome blend, or would the blend still be awesome without it? thanks so much for sharing!! Ooooooh, you could increase the balsam and add some folded orange. That would be lovely. This bar is a beautiful color and must smell amazing, but with it being a pure coconut oil an salt bar, I would be afraid it would take your hide right off! Hi Cyndi! 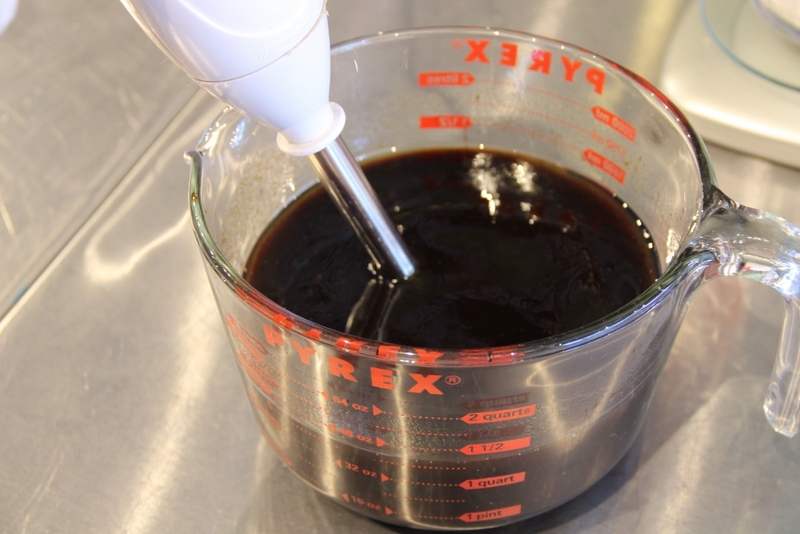 When doing 100% coconut oil in salt bars we use a 20% superfat which leaves plenty of free oils to make it nice and mild. I love this!! Where oh where do you get your bitter almond essential oil? I’ve been looking for an all natural almond scent and haven’t been able to find one. I don’t want any of the synthetics of the FOs. Rainbow Meadow is a great little company with really competitive prices. A little bit of Bitter Almond goes a long way! Keep being great!